Avon Canada celebrates 100 years of beauty with their 100 Days of Beauty Contest! Avon Canada is celebrating being 100 years young by giving you the chance to win a new beauty product each day for 100 days! From perfumes to lipsticks and skincare, Avon is the company that not only brings beauty to doors, but also opens them. The company, that now for 100 years in Canada, has stood for beauty, innovation, optimism and above all for women. Go to Avon Canada’s Facebook page - Facebook.com/MyAvonCanada to enter Avon’s #100DaysofBeauty contest. Avon Elements Skin Revitalize 2-in-1 Brightening Eye Roller - 12ml - $19.99 - with a vibrating rollerball that diffuses the look of dark circles and instantly wakes of tired eyes - and hey it vibrates, how can it be bad?! 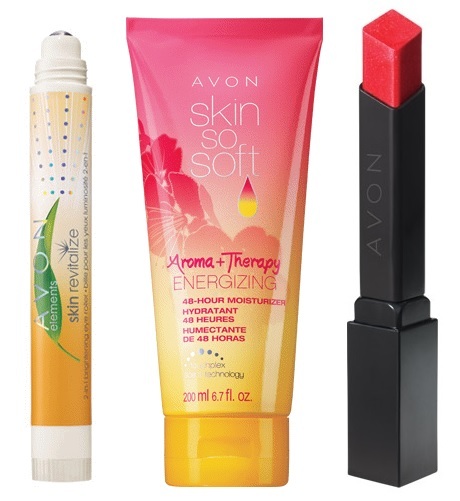 Avon Skin So Soft Aroma + Therapy Energizing 48-Hour Moisturizer - 200ml - $9.99 - with a time-release formula that contains argan oil to provide 48 hours of hydration and infused with touchplex scent technology for an invigorating burst of citrus that can be refreshed all day! Avon Color Precise Lipstick - $9.99 - with a diamond-shape tip that keeps feather-proof colour in line and fills lips with 12 stay-true shades and is formulated with vitamin E, honey and aloe extracts to keep lips moist. A very generous contest! :) I was stunned when I read they were giving away 100 products.